On this page you can define backup schedule for the task. The task will be executed according schedule only if it is ACTIVE. If it is not you can start the task manually only. So you can select days of week to start the task. Example: Every 3rd week at Monday and Friday. Example: Every 2nd month. Archive at 3rd of January and 3rd of June. The task will be executed when APBackup starts but only once per X days. The task will be executed after executing the task # X. You can define different final of the task X: "On execution (failed or successful)", "On successful execution", "On failed execution"
ApBackUp will monitor the source folders and start the task when files or attributes are changed. Date when the task is executed for the first time. 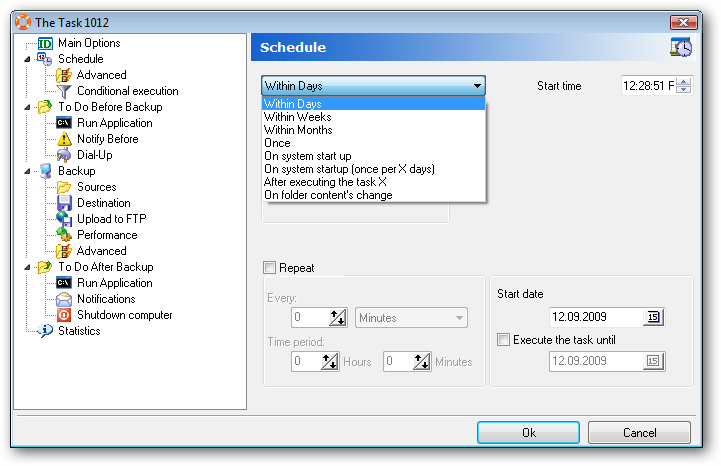 In addition to the main schedule, you can ask APBackUp to repeat task after scheduled execution, with specified time intervals ranging from 1 minute. "Every" - repeat task every X minutes or hours. "Time period" - the period during which the task is to be repeated. So the task will be executed at 1:00,1:30,2:00,2:30,3:00 every day.